Rev. Daniel W. Bellavia has served as the Senior Pastor of First Baptist Church of Greater Toledo since 2007. He has served Baptist Churches in the State of Ohio since 1990. Rev. Bellavia received his Masters of Divinity from the United Theological Seminary in Dayton, Ohio in 1993. Pastor Dan did his undergrad work at Houghton College, where he received a degree in Biblical Studies and Psychology. Pastor Dan is blessed to be married to his bride, Betsy, who has taught choral music in the public schools and is currently working on her Masters Degree at Bowling Green State University. They have four sons; Scott, Christopher, John and James. They also have two grandsons, Gabriel and Daniel Hudson. Pastor Dan spends his free time coaching his children on soccer fields, basketball courts and baseball diamonds. A Western New York native, Pastor Dan is a life-long fan of both the Buffalo Bills and Buffalo Sabres. Dan is a lover of music, especially progressive rock and metal. As a trained percussionist and drummer he is particularly fond of the great drummers in jazz, rock and metal and will gladly talk about Neil Peart, Buddy Rich, or Mike Portnoy if given the chance. In his past he has played in various local bands and community musicals and shows since High School. He still occasionally pinch hits for his son in the Church band on Sunday mornings. Pastor Dan is also a big fan of comic books and spent three years teaching a monthly class on comic book theology at Bell, Book and Comic in Dayton, Ohio. Pastor Dan is a lover of God in Jesus Christ and before all else seeks to be a disciple of Jesus Christ. He is blessed to serve God and God’s people as a local Church pastor where he can lead others to follow Jesus with him. 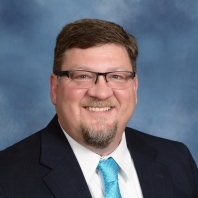 Pastor Dan is both a student of the Bible and a theologian who teaches two theology classes at the American Baptist Churches of Ohio’s Leadership Academy.